Last time Apple make some changes in their policy so you will probably have some issues while building HAT on macOs. 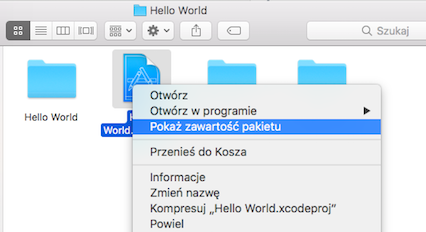 Build a simple Xcode Hello World App, in General please fill Bundle Identifier to your uncial string (this ID will be signed to your account by some time, so it can’t be used twice). Next please sign in your team, if you have any errors, please try to connect your iPhone, and select it in on the top.If everything is ok, your screen should look like below. To get your Apple Team ID, please go to the project directory, right click on your project and select “show package content”. Next right click on the project.pbxproject and search for “team” keyword, then copy DEVELOPMENT_TEAM value. Now into your SAP Hat installation, you could provide your Apple Team ID. Please click on run, and after 2-3 seconds, open config.xml file in TextEditor. Now, replace the widget id com.sap.ide.companion to your bundler id, registered for your Apple Team ID, i.e I used net.testsapapp.id. Save the file as fast as you can, now everything should works fine. This is my first post in SAP Blog, so please understanding.